Hi - Is it true that the deeper the hole on the base of the actual bottle does suggest that the quality of the wine is excellent. When I do purchase reds, I always now turn the bottle upside down and if the hole is deep rather than shallow, I always tend to pick on that particular wine. Up till now I have never been disappointed. I have about 300 bottles of different reds and the best wines do come with this particular shaped glass. Can you advise whether this is true as I am having problems relaying this method of selecting top wines to my friends. Darby says: I'll answer as a comment to this page. I'm sure others will have an opinion about the "punt" as well. Comments for Wine Bottle Base Hole Denoting Wine Quality? Actually I remember seeing a documentary on the first wines that were made and the punt was used to stack two bottles together when the first wine rack was made so it helped to make the 1/4 turn of the battle for cellaring easier. Then when the sediment collected at the cork end they froze it and popped the cork to get ride of the cediment. Topped up with sugar and more wine and re-corked. Nelson´s comment applies to sparkling wine but the original query applied to still wines. Someone who knows wine will taste it to establish if it is of a good quality or not. After time you build up a solid knowledge of good grape varieties, vineyards and vintages. If you're reliant on simply feeling how deep the punt is to buy a wine then good luck to you because you are at the mercy of marketers who realise some people will buy any wine as long as it has a deep punt. Hmm, I was always led to beleive that the punt was put there for scientific values. i.e the stronger the pressurisation of the liquid inside the bottle the deeper the punt. Take for instance champane bottles they have very deep punts followed closely by normal sparkling wines and so on. But this is just my thought. With Stelvin capped bottles now being filled right to the top v. corked bottles with 2 or 3 centimetres of air, the volume of the bottle had to be reduced to still ensure only 750mls.. Hence the deeper punt. My Norwegian brother-in law always check the 'rumpe-hul' to see if it is a good wine. Paul, I agree with you 100%. I actually use this method when purchasing my reds, altho most people, including my husband laughs at me! I have never been disappointed either, not once. As an old "Pom" I was brought up to know my wines. Even as part of my public school curriculum. A good aged red left a sediment and should be decanted. It was easier to do this from a punted bottle as the sediment held better. Like a punt in football it used to mean to push hard before the glass cooled. Never having found an Australian wine intended for laying down I think the punt should go the same way as the cork. You are absolutely correct. Wine which comes bottled in a deep "punted" wine bottle, is more expensive. I always think that if the price is above average for the particular wine and the bottle is taller with an existing deeper "punt", the quality of the wine purchased exceeds expectation. I prefer "heavy" reds with lots of body and character. You are also correct by saying that wineries tend to use more expensive bottles to market what they consider "best selling wines". More than interested to hear from others on this subject. 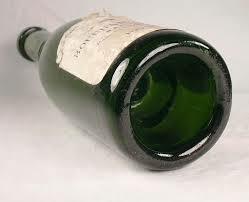 The indentation in the bottom of a bottle, especially a wine bottle is called a "punt". I don't know why but that's what it is called. The punt has a function in sparkling wine (champagne) bottles as it allows closer stacking of the bottles on top of each other during the racking process. In red wine bottles the punt has less of a practical use. The main one is that a bottle with a punt looks larger even though it contains the same amount of wine - 750ml we hope. Size matters! Some wine waiters use the punt to hold the bottle with their thumb in the punt when pouring wine, but I reckon they are just showing off. Is the wine better if it comes in a bottle with a punt? Paul seems to think so. My guess is that winemakers use punted bottles for more expensive wines, cheaper wines often come in very plain bottles. The marketing tactic of using punted bottles obviously works for some people, including Paul. If your method works perhaps you should stick to it. Punted bottles are usually much heavier and hence use more energy fro manufacture and transport so if you wish to minimise your carbon footprint so perhaps you should only punt on special occasions. Paul, you have obviously done some informal market research on this one, did you notice punted wines were dearer? Please leave a comment. Anyone else want to chime in?